Lahore (Agenzia Fides) - Maulana Muhammad Abdul Qadir Azad, who served the faithful as Grand Imam in the Badshahi Mosque in Lahore for about 30 years and died in January 2003, was considered "a great promoter of interreligious peace and harmony and above all of dialogue between Christians and Muslims. He was a great religious leader and a lover of peace. He was an ardent promoter of harmony between different Muslim communities and people of other religions": says the Dominican, Fr. James Channan, director of the "Peace Center" in Lahore, preaching in the Badshahi Mosque, the "Royal Mosque" in Lahore. 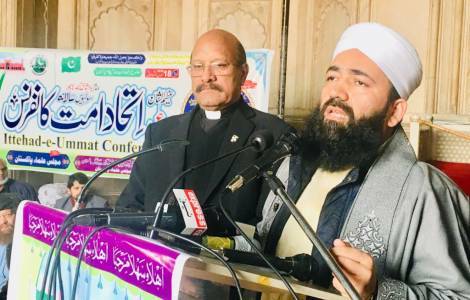 On January 18, before the usual Friday Prayer, Maulana Abdul Khabir Azad, current Grand Imam of the Badshahi Mosque in Lahore and son of the late Abdul Qadir Azad, organized an interreligious conference to pay tribute to his father and invited Fr. Channan to preach from the pulpit of the mosque, and addressed all the faithful Muslims present. Fr. Channan, speaking to Fides, recalls the figure of the Great Imam: "In his life he always had special care for Christians. Often, in those areas where Christians had become the target of militants and terrorists, Azad was among those Muslim leaders who visited and comforted the Christians, when some faithful had been burned alive in Shanti Nagar, and when the church of St. Domenico in Bahawalpur was struck, he cried with the Christians, reassured them, asked for justice. He raised his voice for Christians". Fr. James Channan, who for years worked for interreligious harmony with Maulana Abdul Khabir Azad, addressing the large number of Muslims present and numerous other Islamic Muslim religious leaders, recalled Muhammad Abdul Qadir Azad as "a model for interreligious dialogue" , praising "his leadership and his passion for Islamic-Christian dialogue". He then recalled that his son, Maulana Abdul Khabir Azad, "today plays an important role in building bridges between Christians and Muslims both at a national and international level", thanking him "for opening the doors of this great Mosque of Badshahi to Christians and to people of other faiths, bringing the noble mission of his father to life". Fr. James said that "if all Muslim leaders in Pakistan follow the example of these two great leaders, Pakistan will become a country where people of all religions will live in peace and harmony".